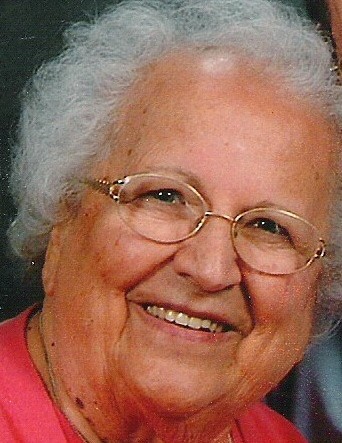 Julia A. Baker, 95, Logansport, passed away at 4:00 p.m., on Tuesday, January 29, 2019, in Miller’s Merry Manor. Born in Logansport on December 23, 1923, she was the daughter of Giuseppe and Marfina Marocco Scagnoli. On September 7, 1946, in St. Joseph’s Church, she was married to Robert E. ‘Pat’ Baker who preceded her in death on November 15, 2008. She had been employed as a telephone operator for GTE for 33 years. Julia was very much a ‘people’ person. Being one of 15 children, she was all about family and treasured her Italian heritage. Her home was always open for the neighborhood children and families as they were growing up, and she was known to host many slumber parties. She was teaching son, Rob, how to play the accordion until they became a baseball family. She enjoyed attending games and feeding the team with her husband, Pat, who coached the Pepsi White Sox team for many years. One year, the team went 15-0. Throughout the years, she would be heard saying, “over the fence for 50 cents”. Although afraid of the water, Julia loved being at the family summer retreat along the Tippecanoe River for nearly 30 years. She was excited when the only grandchild, Maria Suzanne, was born. She and Pat loved going to Zionsville to care for her while her parents worked. She enjoyed babies and animals, arts and crafts, and playing BINGO. While going to Miller’s Merry Manor during the daytime at nearly 90 years of age, she would say she “had to go help the old people there”. While residing at Miller’s, she met her best friend and roommate, Patricia Beaupre, and they would often be seen walking the hallway, hand in hand. She was a member of All Saints Catholic Church. Over the years, daughter, Vicki, loved being able to live with and take care of her mother, and rarely missed a day visiting her in the nursing home. The Mass of Christian Burial will be celebrated at 10:00 a.m., on Saturday, February 2, 2019, at All Saints Catholic Church, with Fr. Jeff Martin officiating. Visitation will be from 5:00 – 8:00 p.m., on Friday, February 1st, at Kroeger Funeral Home. The Scripture Service will be conducted at 4:45 p.m., on Friday, also at the funeral home. Memorial contributions may be made to the Cass County Humane Society, 700 Water Street, or A Cause for Paws, P.O. Box 1402, both of Logansport.